The Art of the Dead by Phil Cushway showcases the vibrant, charismatic poster art that emerged from the streets of San Francisco in 1964 and 1966. It traces the cultural, political, and historical influences of posters as art back to Japanese wood blocks through Bell Époque, on to the Beatniks, the Free Speech Movement, and the Acid Tests. Featuring interviews and profiles of the key artists, including Rick Griffin, Stanley “Mouse” Miller, Alton Kelley, Wes Wilson, and Victor Moscoso. The book includes over 200 large and small reproductions of pieces relating to the Grateful Dead and offers a trip through time with a focus on the artists and the development of the rock poster as a modern art form. The cover of the book was adapted from a 1995 Grateful Dead Mardi Gras poster by Troy Alders. 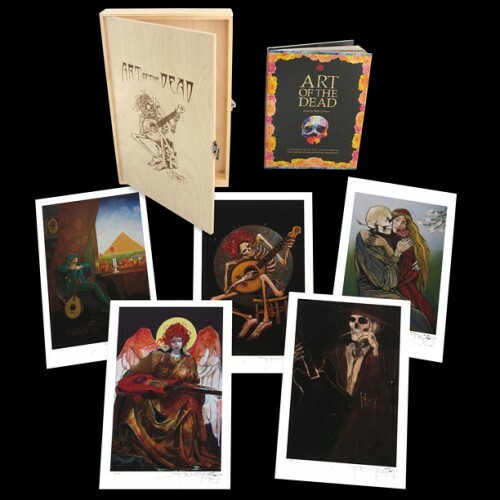 It was just announced that there is a special Art of the Dead limited edition art print box set by Stanley Mouse, a key architect of this legacy. Five 11″ x 17″ previously unpublished archival giclee prints were produced in San Francisco under Stanley’s supervision directly from his original oil paintings and incorporated into an edition of 225. Ken Boxcar Ross liked this on Facebook. Arthur Levitt liked this on Facebook. Delfino López Hernández liked this on Facebook. Thomas Espy liked this on Facebook. Kent Williams liked this on Facebook. I’ve got one of the books and long enjoyed it.